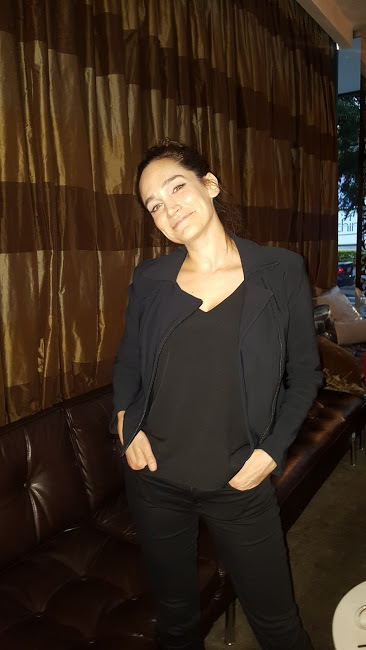 It was a real delight in meeting up in Brisbane with veteran Actress Nicole da Silva to go over the award winning show now in Season 5 Wentworth. The show kicked off on April 4th on Foxtel Showcase. Now in 125 countries Wentworth just goes from strength to strength and is listed for another award for this year Logies. Speaking with Nicole we got a bit of insight to herself and I see why she is on top of her game. Answer: I love it! It’s just so good to play someone that is so bad arse, tough and then the next minute someone so completely soft and venerable. The beauty of the character is that she does swim between the two very much different complex fault filled human being’s, and it is fun to be able to play with that. Question: In preparation of the role is there a lot of work you need to undertake and does it take a lot out of you? Answer: Yes with each episode it does definitely take a lot out of you and every scene requires a level of preparation. As there are some scenes, that require a lot more emotionaly , and physicly for the ones that are highlighted. When your doing the choreography scenes as well as the emotional scences that tends to take quiet a bit out of you, and you’ve just gotta be in the right headspace for them. Question: What’s it like working with everybody in Wentworth? Answer. It’s fabulous to be working with everybody as everyone on screen brings their own flavour and their own fun to the role and that is off screen as well, everyone is so unique and we are all very close. Question: Actress Danielle Cormack I believe you are both very close buddies and also working on other things together as combining production company. Answer: Yes that’s right and from day one it was obvious that the both of us had similar work ethics and we both quest after truth and choices, and we are always there to push each other to those places and that has been a part of the gift of being with Wentworth. As we progressed in each season of the series it become a natural progression for us to start developing our own work. Question: is there anything exciting on the horizon? Answer: Yes it’s all exciting when it’s in embryonic stages and you’re bouncing ideas and that’s where we are at. Question Are you targeting film and TV? Answer: At this stage we are looking at a TV show and a couple film projects. Question: Your nominated for this years Logie awards as best supporting actress congratulations. Where were you when you found out? Answer: I was in bed, and I turned on my phone and I got a message from Celia Ireland, saying congratulations honey I’m so proud of you and I was not aware of the nominations coming out at all, so then I got onto the newsfeed and was vey excited to be again nominated. Question: Have you started preparing what you be wearing for the Logies? Answer: I’m pretty lucky I’ve had a young Melbourne designer who contacted me and will be designing my dress and that’s about the level I am at the moment. The dress could be 1940s Hollywood glamour frock. Question: Do you have a role that you would like to see yourself play? Answer: Nothing too specific I get excited about ideas on philosophy as I’m very into psychology subjects that interests me and I would really like to play a character who tends towards the psychopathic scale that hasn’t been explored in a female character before, so that’s what would be on my agenda. Question :You’ve been living part time in LA what’s that being like? Answer. I first moved to LA 2014 to 2015 and it’s been great and a real learning curve. It’s one of those things that is an extension to an Australian actors career now to go to LA, and it’s not a big thing now as it was say 10 years ago. You literally go there and they have opportunities more so than here, and I’ve been laying a lot of ground work doing auditions, and taking meetings. I did a couple of gigs there last year and the year before and that was great. Question : Give us an example of what auditioning is like over in LA? Answer : Its interesting over there, they have a very different auditioning process, in Australia you will get you’re auditioning scenes and a script, usually two weeks before. In America they give you the scenes and the scrips the night before, which the difference here is you could have up to 2 weeks to prepare for an Australian part, and only a matter of hours in America. Answer: Right now it is Actress Violet Davis is amazing, and loved her in Doubt John Turturro who in The Night Of, an HBO limited crime series. Answer : Labyrinth brings me back to my childhood and it was and still is a favourite. Question: What’s your best advice to emerging actors ? Answer: If you have to do it and it’s in you just do it, and don’t give up. Question: What was your first break being small to big . Answer: There are lots of little breaks along the way that lead to the big breaks so I did so much independent theatre when I got out of acting school, and it is a good place to start as I did show after show lot’s of variety. I did everything I could as I was so hungry to learn. I also made a lot of really good friends that are still my friends to this day that gave me my learning ground for me to be prepared for when the big break’s came along. So where I was learning all the time my first big break came 6 months after drama school where I got cast as a regular on TV series All Saints. Then about 2 years later my breakout roll came on Foxtel with a show called Dangerous. Question : Has there been any one that has inspired you as a mentor throughout your life? Answer : I take my mentors from my colleagues and my peers as there is always so much to learn with them and what you encounter, and they might be around for a week or they might be around for year or ten years. For me there is always something to learn from everyone. I’ve certainly had people that have helped me along the way and John Edwards, a great TV producer gave me my breakout role in Foxtel series Dangerous. I have a lot to thank him for because he then cast me in Rush for Channel Ten. and Jo Porter who has cast me in Wentworth she gave me my first gig which was All Saints when i was out of drama school. So I would have to credit those two as well. Question When you’re not working what is the ideal place you’d love to be at.? Answer. With my family and friends as you don’t get to spend a lot of time with them.